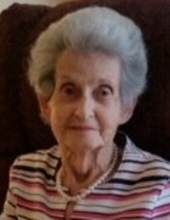 Nellie Mae Merry, age 89, of Columbus, formerly of Sarahsville, Ohio, died Wednesday, February 6, 2019, at Westminster Thurber Independent Living in Columbus. She was born April 13, 1929 in Rochester, Noble County, daughter of the late John and Martha Blanche Archer. She was a 1949 graduate of Belle Valley High School. Nellie was employed by the former Landaker's Bakery in Caldwell and she was a homemaker. She was a member of the Caldwell United Methodist Church, and she was also a member of the Homemakers Club and the Guernsey Chapter #211, Order of the Eastern Star. She enjoyed sewing, gardening, and quilting, and she also enjoyed traveling, having been to Puerto Rico, the United Kingdom, and several states, including a memorable trip to New York City. In addition to her parents, she is preceded in death by her husband, Robert E. Merry, whom she married April 17, 1950; one son, Jerry D. Merry; three sisters, Mary Bell McIlyar, Hilda Yeagle, and Margaret Archer; and two brothers, Paul Archer and Clyde Archer. Surviving are her children, Michael Merry of Cincinnati, Melody Johnston of Centerville, and Pamela Cramer of Galloway; grandchildren, Johnny (Jodi) Merry, Ryan (Christina) Merry, Sam Johnston, Brian Johnston, Joe Monnette, Grace Cramer, and Baron Cramer; great-grandchildren, Allison R. Merry, Heather J. Merry, Matthew Brick Merry, and Maybellene Kit Merry; her sister, Edith Hohman of Caldwell; and numerous nieces and nephews. Friends may call Friday, February 8, 2019, from 5-7PM and Saturday, February 9, 2019 from 10 to 11 AM at McVay-Perkins Funeral Home, 416 East Street, Caldwell, where the funeral service will be observed at 11 AM, with Rev. Beverly Hall officiating. Burial will follow at Olive Cemetery. Memorial contributions may be made to the American Heart Association, 5455 North High Street, Columbus, Ohio 43214 or online at www.heart.org; to Ohio Living Westminster Thurber, 1001 Kingsmill Parkway, Columbus, Ohio 43229 or online at www.ohioliving.org; or to a charity of the donor's choice. To plant a tree in memory of Nellie Mae Merry, please visit our Tribute Store. "Email Address" would like to share the life celebration of Nellie Mae Merry. Click on the "link" to go to share a favorite memory or leave a condolence message for the family.